Culinary uses: GRAPES are sweet and blend well with most fruits. 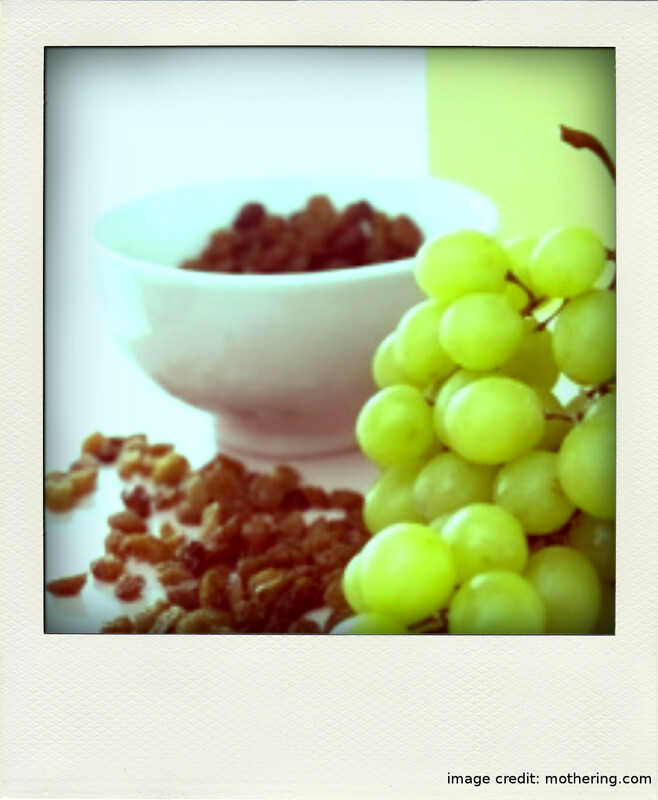 RAISINS add natural sweetness, golden sultanas are a good variety for cooking. Interesting and useful: In Shivananda yoga raisins are regarded as a cure against being overly critical, they promote gentleness. Raisins can be used as a sugar substitute in baking – instead of 1 cup of sugar use 1 cup of raisins and soak them in water, blend well, mix with other liquids used in the recipe and then combine with dry ingredients. I only use raisins and dates in baking and dessert making. Works like a charm! Soak raisins and dried fruit overnight in the water. In the morning blend well & drink. When preparing these posts I learn or revise A LOT of super interesting information and every time I am amazed how absolutely perfect Nature is, giving us everything we need to nurture our bodies properly. This entry was posted in Nutrition & Recipes and tagged Ayurveda, breakfast, food, grapes, Iron, raisins, recipe. Bookmark the permalink.